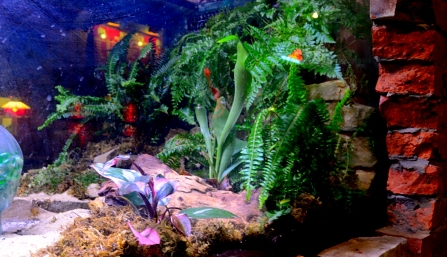 Nautilus Aquatics in Ohio develops elaborate terrarium arrangements for use in vivariums, such as the above photo of an "Indiana Jones" themed mudskipper vivarium. What a beautiful "Indiana Jones" themed mudskipper vivarium. It has very lovely colors used in it. The plants looks very sea life like. It does look rather aquatic, the ferns almost look like seaweed on the ocean floor.